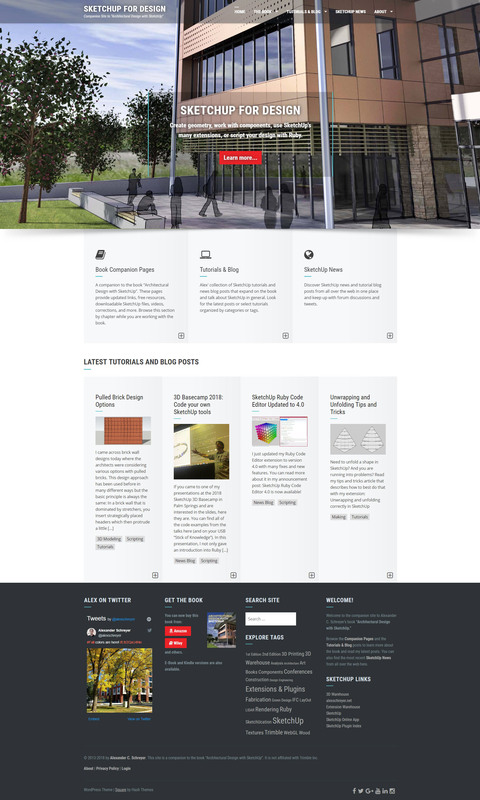 Home » News Blog » SketchUp for Design – New and Improved! I originally created this site at sketchupfordesign.com as a companion site to my book “Architectural Design with SketchUp“. When I did that (in 2012), I came across BuddyPress, an add-on to WordPress that allows for managing an online community, complete with chats, forums, groups, and notification emails. While the idea of creating a community around a book was a good one, spammers, new privacy rules, SSL, and time spent on general maintenance of such an endeavor eventually made me realize that this was a bit too idealistic. Besides, there are many SketchUp forums out there already. As a result, I removed BuddyPress and its functionality completely from this site. This summer I set out on redesigning this site more as a blog where I post news and tutorials related to SketchUp in general and my book in particular. You can still engage in discussions related to book chapters or anything else that’s posted on this site. You can also subscribe to my posts via email (see sidebar), and read the latest SketchUp news from all around the web. And as you can easily see, this change also updates the general design, which was a bit overdue in my view. I hope you like the new site and find it useful. Let me know if you have any suggestions etc.